Perform receipt validation immediately after your app is launched, before displaying any user interface or spawning any child processes. Implement this check in the main function, before the NSApplicationMain function is called. For additional security, you may repeat this check periodically while your application is running. 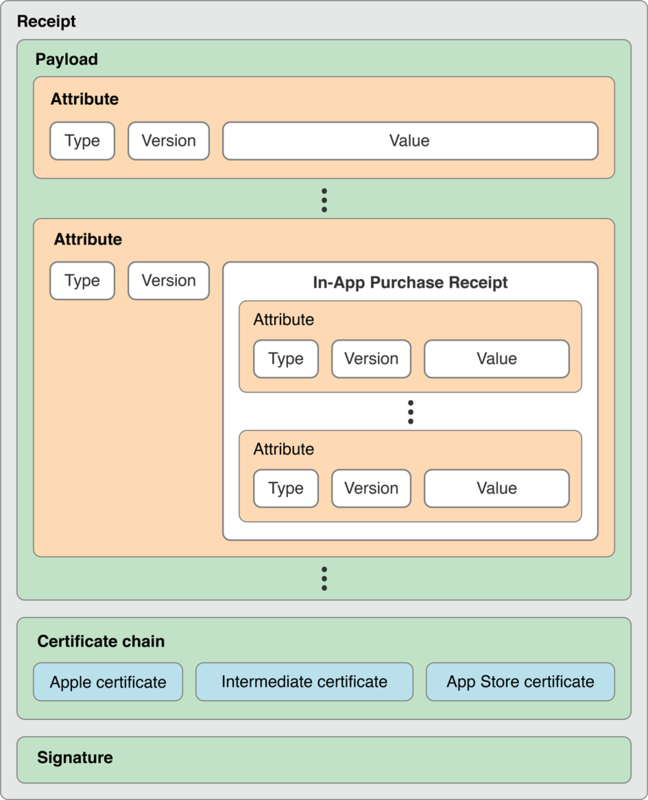 When an application is installed from the App Store, it contains an application receipt that is cryptographically signed, ensuring that only Apple can create valid receipts. The receipt is stored inside the application bundle. Call the appStoreReceiptURL method of the NSBundle class to locate the receipt. Note: In macOS, if the appStoreReceiptURL method is not available (on older systems), you can fall back to a hardcoded path. The receipt’s path is /Contents/_MASReceipt/receipt inside the app bundle. In iOS, if the appStoreReceiptURL method is not available (on older systems), you can fall back to validating the transactionReceipt property of an SKPaymentTransaction object with the App Store. For details, see Validating Receipts With the App Store. The receipt is a binary file with the structure shown in Figure 1-1. The structure of the payload is defined using ASN.1 notation in Listing 1-1. You can use this definition with the asn1c tool to generate data type declarations and functions for decoding the payload, rather than writing that part of your code by hand. You may need to install asn1c first; it is available through MacPorts and SourceForge. For information about keys found in a receipt, see Receipt Fields. After the asn1c tool finishes generating files in the current directory, add the files it generated to your Xcode project. In macOS, use the method described in Get the GUID in macOS to fetch the computer’s GUID. In iOS, use the value returned by the identifierForVendor property of UIDevice as the computer’s GUID. To compute the hash, first concatenate the GUID value with the opaque value (the attribute of type 4) and the bundle identifier. Use the raw bytes from the receipt without performing any UTF-8 string interpretation or normalization. Then compute the SHA-1 hash of this concatenated series of bytes. Verify that the receipt is properly signed by Apple. Verify that the bundle identifier in the receipt matches a hard-coded constant containing the CFBundleIdentifier value you expect in the Info.plist file. Verify that the version identifier string in the receipt matches a hard-coded constant containing the CFBundleShortVersionString value (for macOS) or the CFBundleVersion value (for iOS) that you expect in the Info.plist file. Compute the hash of the GUID as described in Compute the Hash of the GUID. If all of the tests pass, validation passes. Note: Bundle identifiers and version identifier strings are UTF-8 strings, not just a series of bytes. Make sure you code your comparison logic accordingly. If your app supports the Volume Purchase Program, check the receipt’s expiration date. Validation can fail for a variety of reasons. For example, when users copy your application from one Mac to another, the GUID no longer matches, causing receipt validation to fail. If validation fails in macOS, call exit with a status of 173. This exit status notifies the system that your application has determined that its receipt is invalid. At this point, the system attempts to obtain a valid receipt and may prompt for the user’s iTunes credentials. If the system successfully obtains a valid receipt, it relaunches the application. Otherwise, it displays an error message to the user, explaining the problem. Do not display any error message to the user if validation fails. The system is responsible for trying to obtain a valid receipt or informing the user that the receipt is not valid. If validation fails in iOS, use the SKReceiptRefreshRequest class to refresh the receipt. Do not try to terminate the app. At your option, you may give the user a grace period or restrict functionality inside your app. Include the LSMinimumSystemVersion key with a value of 10.6.6 or greater in your application’s Info.plist file. If receipt validation fails on versions of macOS earlier than 10.6.6, your application quits immediately after launch with no explanation to the user. Earlier versions of macOS do not interpret the exit status of 173, so they do not try to obtain a valid receipt or display any error message. If your application is localized, the CFBundleShortVersionString key should not appear in any of your application’s InfoPlist.strings files. The unlocalized value from your Info.plist file is stored in the receipt—attempting to localize the value for this key can cause receipt validation to fail. Avoid simple code constructions that provide a trivial target for patching the application binary. Implement code robustness techniques, such as obfuscation. If multiple applications use the same code for performing validation, this common code signature can be targeted by tools that patch application binaries. Ensure that, even if the exit function fails to terminate your application, your application stops running. Make sure you have Internet access so you can connect to Apple’s servers. Launch your application by double-clicking on it (or in some way cause Launch Services to launch it). Your application fails to validate its receipt because there is no receipt present, and it exits with a status of 173. The system interprets the exit status and attempts to obtain a valid receipt. Assuming your application signing certificate is valid, the system installs a valid receipt for the application. The system may prompt you for your iTunes credentials. The system relaunches your application, and your application successfully validates the receipt. With this development receipt installed, you can launch your application by any method—for example, with gdb or the Xcode debugger. Parse and validate the application’s receipt, as described in the previous sections. If the receipt is not valid, none of the in-app purchases are valid. Parse the in-app purchase receipts (the values for the attributes of type 17). Each in-app purchase receipt consists of a set of attributes, like the application’s receipt does. The structure for these receipts is defined in Listing 1-2. As when parsing the receipt, you can generate some of your code from the ASN.1 description using the asn1c tool. Ignore all attributes with types that do not appear in the table—they are reserved for use by the system and their contents may change at any time. For information about the fields in a receipt, see Receipt Fields. Examine the product identifier for each in-app purchase receipt and enable the corresponding functionality or content in your app. For information about how to calculate a subscription's active period, see Working with Subscriptions. If validation of an in-app purchase receipt fails, your application simply does not enable the functionality or content. The attributes for the original transaction identifier and original transaction date are used when a purchase is redownloaded. The redownloaded purchase is given a new transaction identifier, but it contains the identifier and date of the original purchase. This section contains several code listings for your reference as you implement receipt validation. In macOS, follow the model in Listing 1-3 (or even use this exact same code), so that the method you use to get the GUID in your validation code is exactly the same as the method used when the application’s receipt was created. // Returns a CFData object, containing the computer's GUID. Use the following code listings as an outline of one possible implementation of receipt validation using OpenSSL and asn1c. These listings are provided to guide you as you write your own code, by highlighting relevant APIs and data structures, not to use as a copy-and-paste solution. If you use OpenSSL, statically link your binary against it. Dynamic linking against OpenSSL is deprecated and results in build warnings. Verify the signature (Listing 1-4). Parse the payload (Listing 1-5). Extract the receipt attributes (Listing 1-6). Compute the hash of the GUID (Listing 1-7).